Ciaran Clark is injured and will not play today at St. Andrew’s against Birmingham and we would expect Grant Hanley to get the start in his place in central defense. 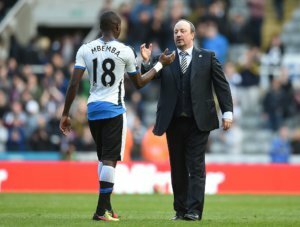 However, Rafa Benitez talked yesterday about a man who seems to have been out in the cold this season at Newcastle – 22 year-old Chancel Mbemba. Even though Chancel has hardly played this season after being a regular last season, he remains upbeat and still wants to prove himself at Newcastle. The former Anderlecht player has appeared only 8 times this season compared to 35 times last season in the Premier League. A number of fans believe he will be sold this summer, simply because he has hardly been used this season by the manager. We’d be surprised if Grant Hanley doesn’t start the game for Newcastle this afternoon but at least Chancel should be on the bench,. It’s been strange how Mbemba hasn’t been used this season, but it’s due to the very good form in central defense of both Jamaal Lascelles and Ciaran Clark. Clark in particular has been one of our best players all season and seems to be in the best form of his career. Chancel Mbemba can also play right back but DeAndre Yedlin and Vurnon Anita have been played there and have also done well. He’s such a good character and so positive it would be a pity if he does leave Newcastle in the summer. How Will Newcastle Fare at Birmingham? Copied and pasted with one change, although I think it will be Dwight up front but Murph been the spark for us lately, so Rafa might start him.